NASA's ATREX mission will launch five rockets within five minutes to help scientists study the high-altitude jet stream located 60 to 65 miles above the surface of the Earth. 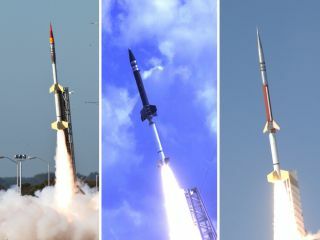 The rockets being used for the mission are two Terrier-Improved Orions (left), one Terrier-Oriole (center) and two Terrier-Improved Malemutes (right). This map of the United States' mid-Atlantic region shows the flight profile of NASA's five ATREX rockets, as well as the projected area where they may be visible after launch on March 14, 2012. The rockets' chemical tracers, meanwhile, should be visible from South Carolina through much of New England.